East-Tec Backup 2007 is the older version of East-Tec Backup 2009, which is an automatic backups and data compression software for Windows based system to protect again hard disk failure, accidental deletion, computer crash and other unfortunate events. East-Tec Backup 2007 can create backup of files, Windows registry, emails with rules for Microsoft Outlook, Outlook Express, Thunderbird, Firefox, Opera and user settings. Backups by East-Tec Backup 2007 can be saved and stored on any kind of storage device such as internal or external hard disks, LAN, CD/DVD, removable media devices (USB sticks, memory sticks, flash memory, floppy disks, ZIP disks, JAZ, etc. ), including remote locations using FTP support. East-Tec Backup 2007 also supports backup privacy with 256-bit AES strong encryption, and can create self-extracting backups or standard Zip archives. East-Tec Backup 2007 costs $39.95 to purchase. As part of promotion with VNU, everybody can get a free full version commercial license for East-Tec Backup 2007 with genuine working serial license key. 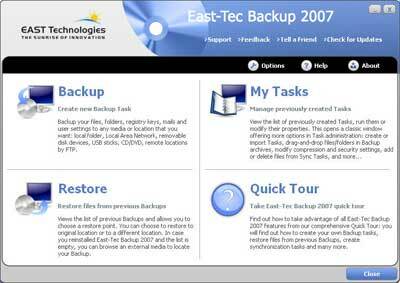 To grab your own copy of East-Tec Backup 2007, just visit the following page, and enter your name and email address. Applicant will receive an email with license number or serial code for East-Tec Backup 2007. Use the serial number to activate East-Tec Backup 2007 to full version product. The free license key for East-Tec Backup 2009 is also available.